Have you noticed all the Halloween decor already? Me neither! All kidding aside, you probably saw Halloween decor out this early September. I saw Halloween decor on family homes last week. They are really enjoy Halloween and want to enjoy all things Halloween early or not sure what the other reason would be. Actually, Halloween is one of the holidays I never really forward too until after Halloween to grab on the 50% off candy. Now, I look forward to it since my babies are October babies. I enjoyed picking out their halloween costumes, going to Halloween parties and planning for children’s birthday parties. Now I was not able to dress my baby bump when they time came but love seeing all the ideas that are out there. If you are looking for a costume idea or ideas, here are some of my favorite for both couples or just for mama! Grab the pregnant housewife costume and here’s the milkman’s costume on Amazon. Kangaroo Outfit – Find one on Amazon. Here’s a DIY Pregnancy Skeleton idea that is simple. Just grab the pregnancy skeleton decal on Amazon and iron on. Voila! You can make the pregnancy skeleton costume a couple set with the t-shirt. You can grab the Real Men Make Twins shirt on Amazon. 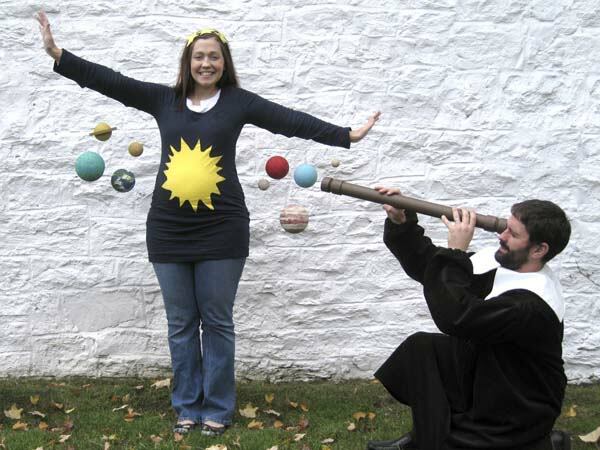 Get out of the world creative with a solar system costume like this one we found on Really Awesome Costumes. Just want to wear a tee? Here are some Halloween Tees to check out. Looking for something more creative? We recommend Etsy’s Halloween Shop.